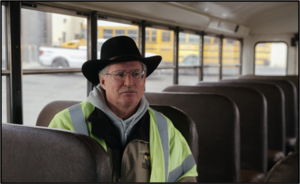 This video features Craig Heasley who has driven bus for Mead for seven years. While Mr. Heasley's impact on the students he transports is the focus of the video, his story is not unique. Read more . . .
Each of our drivers is dedicated to welcoming students, keeping them safe and assuring parents their children are in good hands as they travel to and from school each day.